tea light holders, hanging votive cups, sconces and more. Containers used as terrariums and terrarium planting and growing accessories and terrarium decor items. work best with votive candles to get maximum burn time. 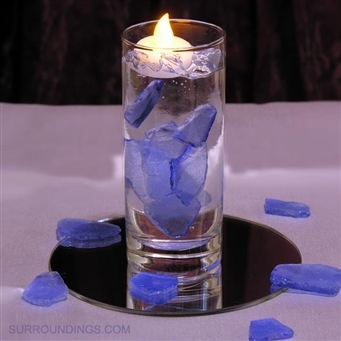 Try using these cups as liners to protect your favorite candleholders. 2x2.5"h.
Roly polys are perfect little cups for small floating candles - rounds, roses, hearts or shells. Drop some water gems or glass gems in cup for extra sparkle. Cups are 2.5" x 2.5" opening. Votive cup is 2" x 2" tall. Perfect for tea lights or 10 hour votives. 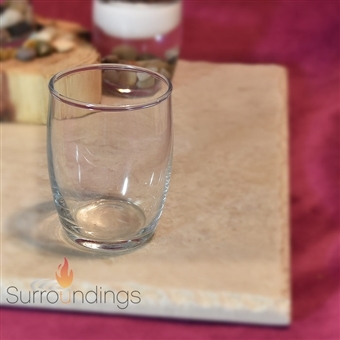 New shape of clear glass votive cup. a little taller and slicker with a nice rounded shape with a slight flare. Votive cup is 2" x3"
Glass test tube bud vase is 6" with a 1" opening. 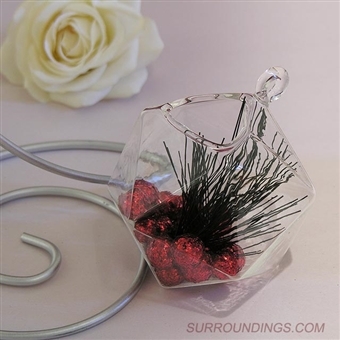 Create unique displays with glass bud vase using decorative wire. 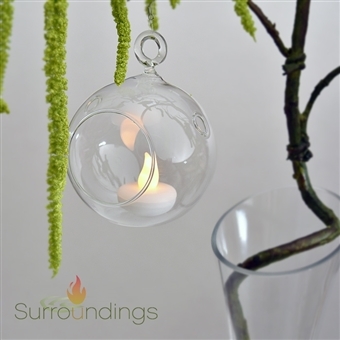 3" Floating tea light holders add a pretty delicate look in your bowl or vase. Also use them to hold and float flowers. Cylinder is 2.25" x 5.5" tall. This little cylinder is a nice size. A little bigger than a basic votive cup, it can stand alone for smaller jobs or mingle with taller cylinders for a bigger display. Ideal for smaller centerpieces and all kinds of decorating. The glass bowls are 4" x 4". Opening is 2.6". This smart looking Diana vase is 3.25" wide and 6.5" tall. Acrylic Round Centerpiece Mirror, 6"
Add 6" round centerpiece mirror to complete and anchor your centerpiece. Votive cups come with beaded mini wreaths. Group together or display them individually on cocktail tables. Jubilee mini tree is a great addition to your tablescape. Tree is hollow. Fill with shred, beads or any colorful accent to match your decor theme. Tree is 1.75" x 6.75. Also see medium tree. Overall length including wire is 6". Votive cup is 2" x 3". Votive is a nice shape for rectangular tables. fits three 2" candles. It's 8.5" wide and 3" deep. 2.5" glass, round name holder doubles as a vase. Use your imagination to incorporate your colors. Add beads, pearls, diamonds or coffee beans along with a simple stem. Opening is about .5". The elliptic shape of this vase gives a soft elegant appearance. Vase is 10" tall and is 3.25" wide. All items sold separately. Little glass bubble vase measures approximately 2.25" x 2.5" with a .75" opening. 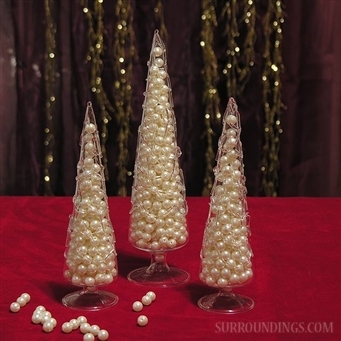 Silver or gold glitter pebbles work perfectly as fill for these cute bubble vases. Then add your favorite bloom or greenery. Create an elegant centerpiece by floating a single flower stem in glass flower ring. 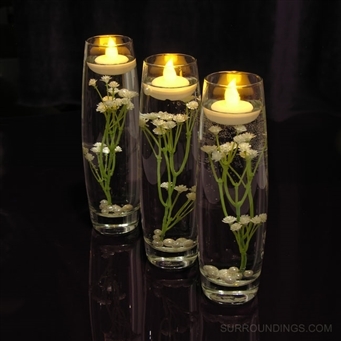 Float candles next to flower ring for added ambiance. of glass to add small decorative fillers. Sizing will vary slightly. Flower rings are sold individually. Create stunning displays with rich, golden color of small pot. Exotic design of ceramic pot will add beautiful contrast to any floral arrangements or a floating candle! Mini pot is 3" tall x 3.25" wide at base x 2.5" opening. The elegant shape of this little vase will give you a dramatic look with little effort. 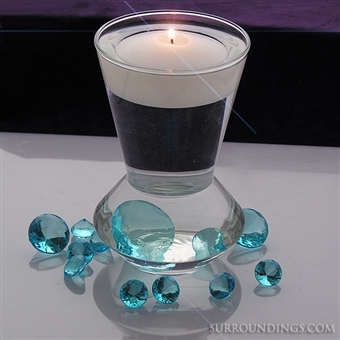 The Accent spots and Mini Rounds and small Sphere candles work best with this vase. It measures 8" high x 2"wide. Opening is 1 7/8". Items shown with vase are sold separately. Hanging glass bubble vase, 3"
Decorate with these delicate glass bubble vases. Use 3" vase for a single flower. Just add a little water and place flower head on top. You can also create mini terrarium displays. Check out our pinterest page to get ideas for decorating with bubble vases. See quantity discounts for this vase. Small Alexia vase is still a nice size to use on its own as a centerpiece vase. Outside diameter of vase is 3" with the inside diameter being just under 3". Sizing will vary slightly. All items shown with vase are sold separately. 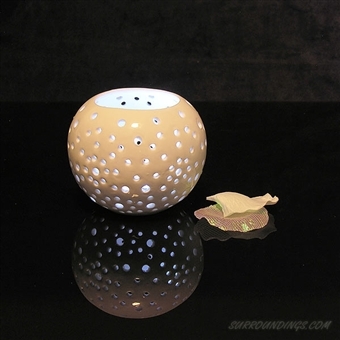 Starlight tea light candle holder has a white shiny finish with small holes for light to escape beautifully. Candle holder is 3.5 x 3". Hanging glass bubble vase, 4"
Decorate with these delicate glass bubble vases. Use 4" vase for a single flower. Just add a little water and place flower head on top. You can also create mini terrarium displays. Check out our pinterest page to get ideas for decorating with bubble vases. 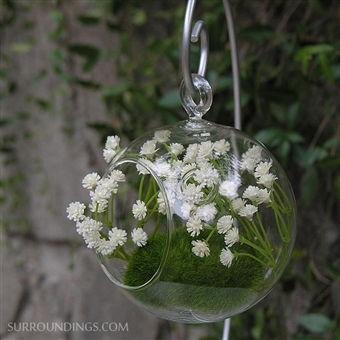 Items pictured with vase, swirl stand, baby's breath and moss rocks all sold separately. See quantity discounts for this vase. Hanging Pixel Glass Vase, 3.5"
Pixel glass is great as hanging vase or ornament for holidays and parties. Glass is 3.5". Soft shape of bud vase says soft romance. Add one to every place setting or line them up on a rectangular table. Vase measures 1.625" x 7.5". Ideal for smaller centerpieces and all kinds of decorating. The glass bowls are 5" x 6".